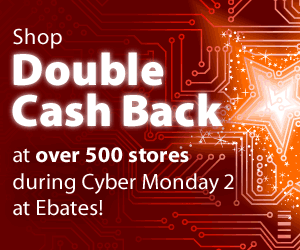 Ebates is having a Cyber Monday 2 with double cash back for over 500 stores! Ebates is one of my favorite cash back sites (you purchase an online product and you get a % rebate back on the total of your purchase). ENTERTAINMENT BOOK!!!! This book contains tons of local coupons including grocery coupons (Price Chopper always has a coupon in there for my Price Chopper readers!). The books are $19.99 and $15 for additional books. Cyber Monday deal – 35% off!! Spend $19.99 on one and get $7 back ($13 total) or spend $34.99 on two (use one for a gift) and get $12.25 back. The Disney Store – 10% back plus you can use the coupon code MAGICAL to get 10% off $50, 15% off $75, $20 off $100, or 25% off $125 and you get free shipping! Purchase $125 worth of items for $93.75 after the coupon code and get an additional $9.38 back. Restaurant.com – 30% back on already reduced restaurant gift certificates. They have a deal right now for $35.95 where you can get three $10 Subway gift cards and three $25 restaurant.com gift certificates. You will get $10.79 back on that order, making your total only $25.16 for $105 in restaurant gift cards and certificates. Old Navy – 5% back on tons of already reduced and sale items. Magazines.com – up to 52% back on super easy Christmas gifts! Hurry!!! Get the deals while you can, the clock is ticking. One lucky Little People Wealth reader will win $250. Spend it on holiday shopping or on yourself – it’s your choice! Become a member of Ebates! You MUST be an Ebates member to win! The winner will be determined using random.org on Wednesday December 14th. Odds will depend on the number of entries received and the number of entries you complete. Transaction #1 = Purchase a Goody hair accessory and spend $2. You will get a $2 RR back. Transaction #2 = Purchase the Salon Pas pain relief patch and 2 maalox. You will spend nothing after using the coupons listed in the match and the previous transactions RR. You will get a $1 RR back. You will have $1 in Register Rewards to use on anything in the store or save for next week. Find out This Sunday’s Coupons Today! How I Make Money Online – Real Numbers, Real Checks!